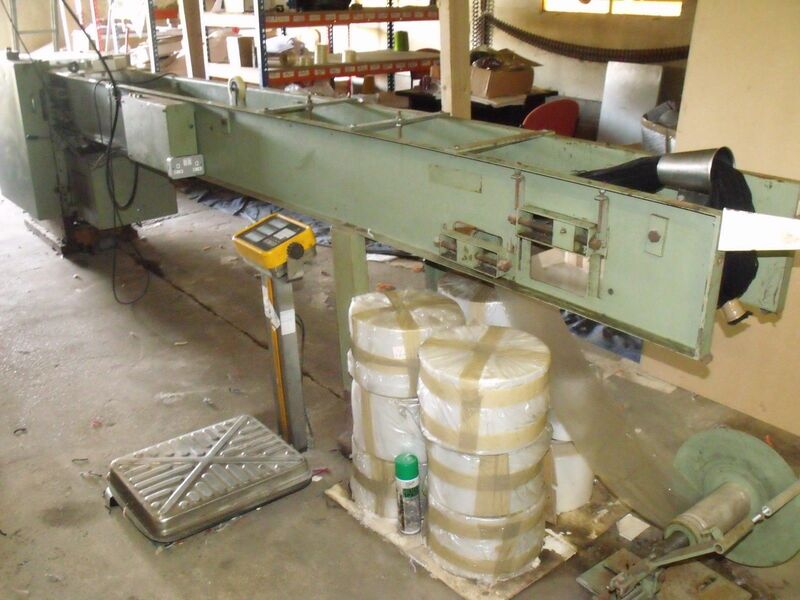 This Atelier Pierret CT28-2R, built in the 1980s and operated by Viveeda Crafts until 2016, cuts and packs rug yarn at a rate of one pack per second. It is described as “built like a tank” and extremely reliable. More modern versions cost over £70,000. These photos have kindly been provided by Ian Gibson of Viveeda Crafts, Lancashire (formerly Designer Stitches (specialising in Disney film characters, especially Winnie the Pooh; a small family firm from Lancashire) when he retired. 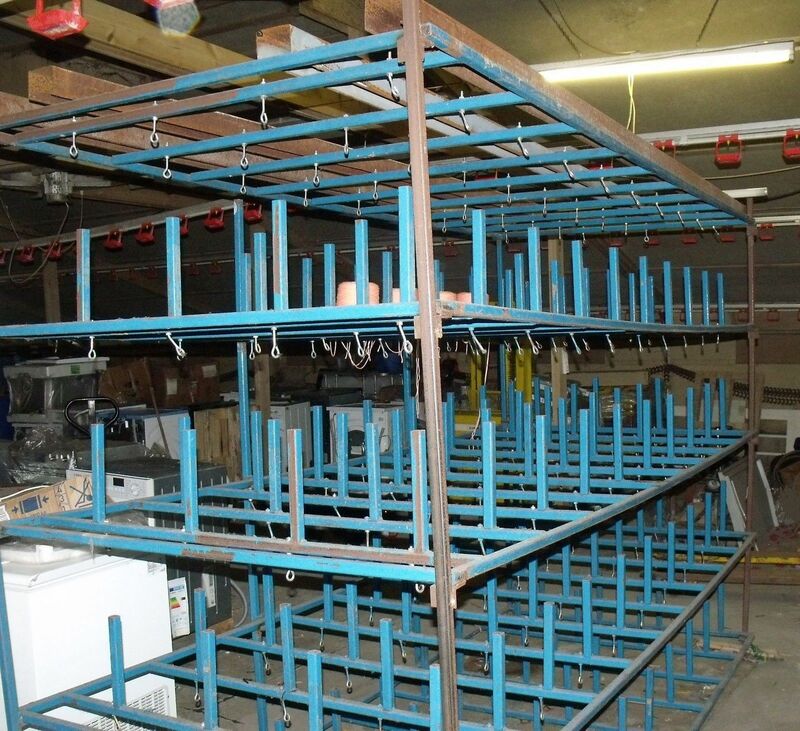 The wool is taken from cones on multiple spindles on a rack and fed into the cutting and binding machine. It is compressed and a plastic sleeve is wrapped around the strands. This "wool sausage" is then cut into individual cut packs (of a pre-set length) by a rotating blade. As the simple diagram from a Pierret sales brocuhure shows, yarn is drawn into the machine from a number of spools/cones, compressed, wrapped in a plastic sleeve and cut to length. The number of strands in each pack corresponds to the number of source spools. Pierret, established in Belgium in 1925, specializes in the manufacture of guillotine cutting machines and automatic feeders for textile and soft plastic waste recycling. In his book “The Onion Peeler” by Malcolm Whyman, the author describes working at Bairnswear, Nottingham Road, in Sherwood in the 1940s and 1950s. Here’s a synopsis of the Bairnswear rug wool process based on his descriptions. At first, Malcolm’s job was to help transport the bales of rug wool from the bale store and distribute them among the “winders”; the women who, with the aid of a machine, wound the hanks of wool from the bales onto cones. His next task was to load up the creels; large, aluminium constructions with a hundred and seventy pegs on either side i.e. totalling 340 pegs, which meant 340 strands in each pre-cut pack of rug wool at the other end of the process. The cones of wool were fitted onto the pegs of the creels, and the loose ends of the 340 cones of wool were drawn together and tied with a length of sisal twine. The creel was wheeled into position behind one of the two cutting machines(which he describes as resembling Heath Robinson contraptions). The bundle of wool threads was drawn along the machine through a series of grabs which pulled the wool past a roll of paper that wrapped itself around the bundle of threads. 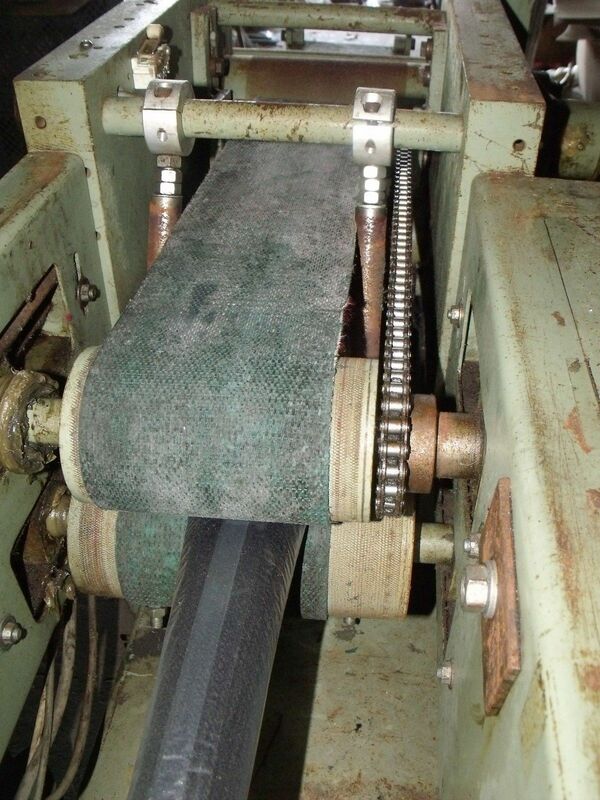 A roll of gummed tape was moistened by the machine and stuck the two sides of the paper together. The wool resembled a paper-covered sausage. After being packaged into this roll it passed under a guarded blade, similar to a bacon slicer, that chopped the sausage into individual packs of 2 and 7/8ths of an inch long. The cutting machine operator checked the packs against a wooden block then packed them into cardboard boxes and labelled the box. The cutting machines were efficient, but not high-tech, and had been invented by company employees. They were the only two of their kind in the world and Bairnswear held the patents, which meant that their main competitor(s) had to sell cutting gauges so that customers could cut their own wool. At the time, those two cutting machines gave Bairnswear the competitive edge. Bairnswear’s patent meant that competitors would either have to invent their own machinery that didn’t infringe the patent. Readicut, whose very name meant the yarn was already cut to length, must have had a packing and cutting machine of their own; their pre-cut packs contained 330 strands. Although numerous Readicut catalogues showed the factory, they didn't show the cutting machinery.